JASH Vibration Isolation Work Table (VIWT) is mainly known as Optical & Opto-Electronics Laboratory Work Table used in Laboratories as Work Station for PASSIVE ISOLATION for sensitive equipment like Laser, Optics, Optical and Electronic Scales, Medical Equipment and measuring instruments. These precision work tables are also used in Metrology Rooms / Laboratories for measurements of very precise components like roundness testers, gear measuring machines, surface measuring machines, etc. The top working surface of Vibration Isolation Work Table (VIWT) can have very precise top working surface conforming to Grade ‘II” or Grade ‘I” or Grade ‘0’ flatness accuracy as per DIN – 876 or IS: 2285 / IS: 7327 or other Customer specified surface flatness accuracy – finer or coarser as may be required. The work table can be of Granite Stone or SH-V Stress Relieved Gray Cast Iron. The Work Table top surface can have features of drilled holes, tapped holes, guiding grooves, milled T-slots or any other features as may be required for applications. VIWT has feature of low frequency isolation and self leveling of Work Table. Work Table can be isolated from vibrations up to (a) Vertical natural frequency approximately 2.0 Hertz or better and (b) Horizontal natural frequency approximately 3.0 Hertz or better. For some applications coarser vibration isolation up to about 10±2 Hertz or more can also be supplied. 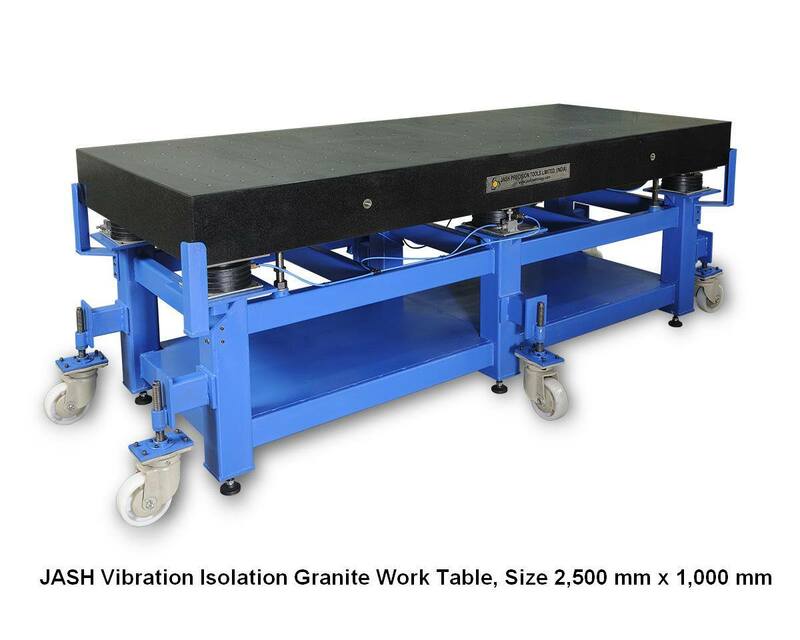 Get high quality vibration isolation table from the leading manufacturer and supplier of precision tools. The Vibration Isolation Work Table must be installed under clean Metrology Room environments. 1. SH-V stress relieved torsion free welded steel tube frame that is supported onto adjustable feet underneath frame legs essentially resting onto firm, rigid, non-flexural and stable floor. Optionally, in addition to adjustable feet the VIWT frame can also have as an option castor wheels mounted onto VIWT frame to facilitate move / relocate work table system as required. Unless specified otherwise the standard adjustable working height of work table surface is 900±25 mm from floor level. Standard supply is frame without castor wheels. 2. Vibration Isolation Air Springs are strategically located and fixed on to top of the VIWT frame. Work table is supported on to minimum four air springs at Airy / Bessel Points of supports (1/4 to 1/5 from sides) and is leveled on 3-point leveling system. Depending upon overall work table size air springs could be more than four. Unless specified otherwise standard passive vibration isolation will be about 10±2 Hertz. The frame also has mounted air filter regulator unit with respective air tubing for air springs and level control system. A 3-point level control valve unit is mounted on to the VIWT frame. The system requires on-line clean, moisture free & oil less dry air at 5 bar pressure. No oil lubrication is required for the system. If not specified, standard active / auto level control will have approximate leveling accuracy up to ± 150 microns. Optionally, the system can have very accurate active / auto level control system that can approximately auto level the work table to an accuracy up to ± 20 microns. 3. As required the work table that can be of either Granite Stone or SH-V Stress relieved Gary Cast Iron or non-magnetic stainless steel. The top working surface can have array / grid of tapped holes or any other features like drilled holes, guiding groves, T-slots as well as User specific. *Maximum load capacity on work table is based on Grade ‘II” accuracy of work table. For flatness accuracy Grade ‘I” this load will be 50% and for flatness accuracy Grade ‘0’ this load will be 30%. Please note, Stainless Steel Table tops will have lower load capacity, meant for light loads only. Upon requests larger work table sizes up to 4,000 mm x 2,000 mm can also be supplied.